(Newser) – When your security camera makes you feel less secure, there might be a problem. Especially when a voice emanating from the other end claims to be a "white hat hacker" from the "Anonymous Calgary Hivemind." That's what Andy Gregg tells the Arizona Republic happened a few weeks ago, when the real estate agent was in his Phoenix backyard and heard a voice speaking to him through the Nest Cam IQ camera inside his home, "in the creepiest way possible," per Motherboard. "Who is this?" Gregg asks warily in a video he took. The voice on the other end replies, "You've never met me, I'm a security researcher from Canada." Hence the "white hacker" nickname, which indicates someone who purposely infiltrates a system to warn users about its vulnerabilities, for their sake and others'. "There are so many malicious things somebody could do with this," the voice continues. Hackers need to come out wherever they are, all this hiding stuff is getting to be very unmanly or unwomanly. Reveal yourself, Satan. People steal WITHOUT WiFi as well. We opened a military credit union account to obtain a home mortgage from them. Went on a 3 month trip x US. When we returned we picked up our mail. In it was terms and conditions and payment book for a $27,000 loan. CU investigated and wiped it off our credit like immediately. Never heard about it again. My occupation was finance for 35 years. You have to watch everything. 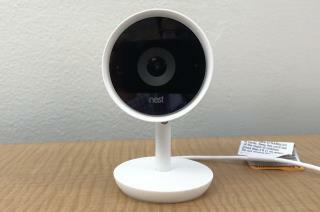 There is simply no reason to have an internet-connected camera in your home. The one on your laptop should be taped over when not in use by you. Security cameras do not have to be internet enabled. Someone can check on your pet when you are away - you don't need to talk to it through a damn camera.